There are 93 Assisted Living Facilities in the Sunrise area, with 6 in Sunrise and 87 nearby. The average cost of assisted living in Sunrise is $2,065 per month. This is lower than the national median of $3,346. To help you with your search, browse the 504 reviews below for assisted living facilities in Sunrise. On average, consumers rate assisted living in Sunrise 3.5 out of 5 stars. Better rated regions include Plantation with an average rating of 4.2 out of 5 stars. Caring.com has helped 6 families in Sunrise find high-quality senior care. To speak with one of our Family Advisors about assisted living options and costs in Sunrise, call (855) 863-8283. Located in the heart of South Florida, the city of Sunrise is part of the Miami-Fort Lauderdale-West Palm Beach metro area and is home to more than 250 acres of municipal green space. This includes a large number of parks and facilities with a full-range of amenities, an appealing neighborhood quality for seniors who love the outdoors. Seniors can move in and seek residency in six assisted living facilities within the city or in the 56 others located in nearby areas. ALFs in Sunrise and the rest of Florida are regulated by the state’s Bureau of Health Facility Regulation under the Division of Health Quality Assurance. The state of Florida has no income tax and does not make any deductions on Social Security retirement benefits and pension income. Seniors in the city of Sunrise enjoy substantial savings through this statewide tax policy. Summer months in Sunrise can become uncomfortably hot and humid, with average temperatures going as high as 91 degrees in July. However, the city gets an average of 0 inches of snow per year, which is beneficial for seniors who have low tolerance for extremely cold conditions. Compared to Florida's cost of living index of 111, Sunrise has a higher index of 117, although it is below the 126.3 for the whole Miami-Fort Lauderdale-West Palm Beach area. Health care registers the lowest index in Sunrise, which is a positive indicator for seniors needing long-term care. The Sunrise area is home to a world-class medical facility, the Encompass Health Rehabilitation Hospital, in the event of medical emergencies or illness. Catering to residents aged 55 and above, the Sunrise Senior Center has been operating since 1995, offering leisure and educational programs, special events and trips. It encourages seniors’ active participation in community activities and is a recipient of the Florence R. Goldman Distinguished Senior Center Award by the Florida Association of Senior Centers. Sunrise operates a low-cost mini-bus service that offers regular transport schedules on dedicated routes. These buses have accessibility features such as handicapped lifts and wheelchair stations. Medical transportation is also granted to eligible residents 62 years or older. Assisted Living costs in Sunrise start around $2,065 per month on average, while the nationwide average cost of assisted living is $4,000 per month, according to the latest figures from Genworth’s Cost of Care Survey. It’s important to note that assisted living rates in Sunrise and the surrounding suburbs can vary widely based on factors such as location, the level of care needed, apartment size and the types of amenities offered at each community. 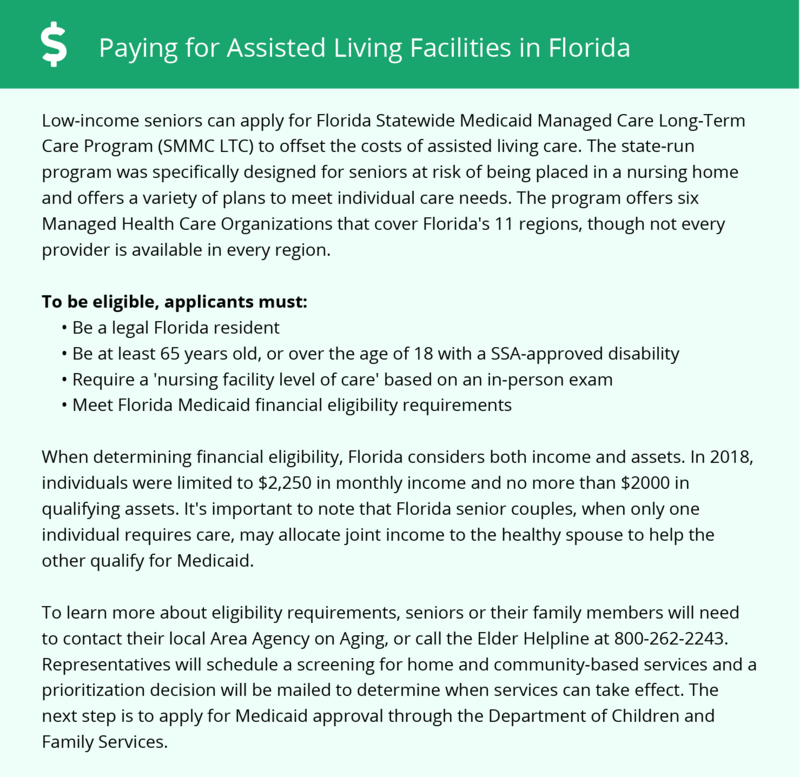 The state of Florida, including the city of Sunrise, offers a Statewide Medicaid Managed Care Long-Term Care program to qualified Medicaid recipients. This covers long-term care managed plans, including assisted living facility services. The state’s Assistive Care Services also provides services to low-income residents of assisted living facilities. Sunrise and the surrounding area are home to numerous government agencies and non-profit organizations offering help for seniors searching for or currently residing in an assisted living community. These organizations can also provide assistance in a number of other eldercare services such as geriatric care management, elder law advice, estate planning, finding home care and health and wellness programs. To see a list of free assisted living resources in Sunrise, please visit our Assisted Living in Florida page. Sunrise-area assisted living communities must adhere to the comprehensive set of state laws and regulations that all assisted living communities in Florida are required to follow. Visit our Assisted Living in Florida page for more information about these laws.